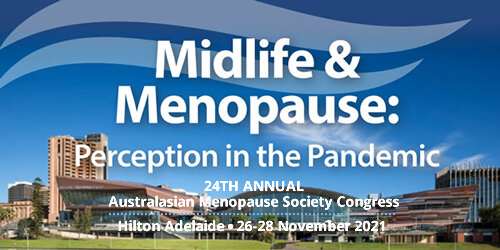 Members of the Australasian Menopause Society Limited (AMS) are doctors and other health care professionals who each have a special interest in women's health in midlife and menopause, and the promotion of healthy ageing. Whether information is needed about peri-menopause, MHT/HRT and alternatives, osteoporosis or how to locate a doctor interested in women's health, the AMS seeks to bring accurate, evidence-based information to health care workers and the wider community. The transition through menopause may raise many individual medical questions. While it's not possible ethically for AMS to answer these questions, the Society provides Health Information which may be freely accessed to help women and their health professionals better understand the transition through this stage of life. Members of the Society have access to a range of services. The AMS holds an annual scientific congress in Australia or in New Zealand and members are able to attend at special reduced registration rates. A secure area on this website for Members contains educational resources including abstracts, case studies and commentaries on currently published papers, position statements and Cochrane reviews. There are useful links to other related organisations. The Society's journal 'Changes' is available in the members' area on this website. A monthly AMS eNews is also circulated electronically with news of events and updates.